Some shenanigans opened practice at the St. Thomas Ice Arena earlier today as the Kings were split between forwards and defense and the two sides competed in a 14-on-7 scrimmage in which all players had to use an opposite-handed stick. The photos posted don’t quite do the game justice, but at one point the shorthanded defense held a 1-0 lead. Credit the forwards for finding the equalizer off an 8-on-0 rush. Not pictured: A Drew Doughty NHL 1994-style goal celebration. It started and ended before I could take the camera out of its case. Several players were selected to attempt opposite-hand shootout moves. While I didn’t catch those, I did get some video of a rapid-fire shootout drill. 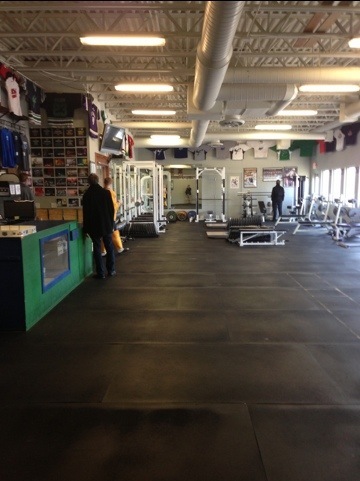 Pictured below: The weight room at the St. Thomas Ice Arena, which was ringed by a collection of local high school and collegiate jerseys as well as signed memorabilia by alumni of the rink such as Derek Stepan and Jordan Schroeder, amongst many other players.